When Harry Potter & The Chamber of Secrets (the book) came out back in 1998, the Whomping Willow was one section that sounded so cool. When the movie came out, that massive moving hulking tree flailing around was spectacular. 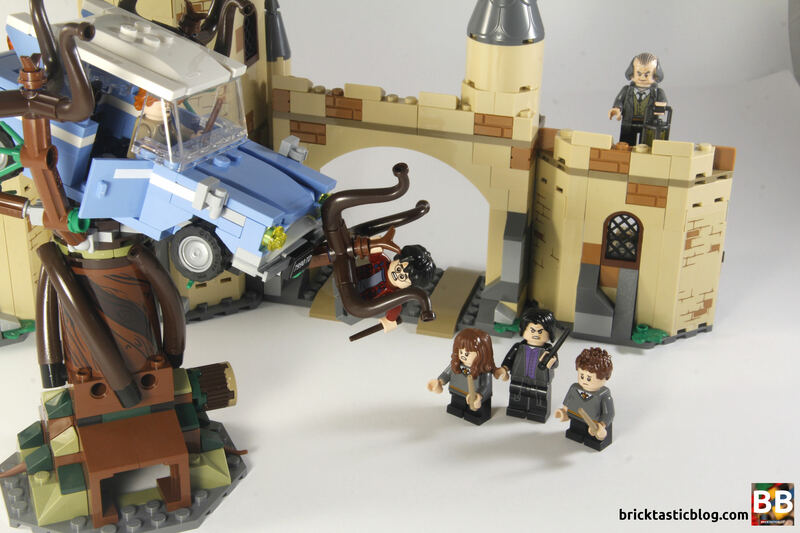 It’s so great to see it immortalised in LEGO, so let’s get straight in. Inside the box you’ll get five numbered bags, two instruction booklets, and a sticker sheet with 16 stickers. 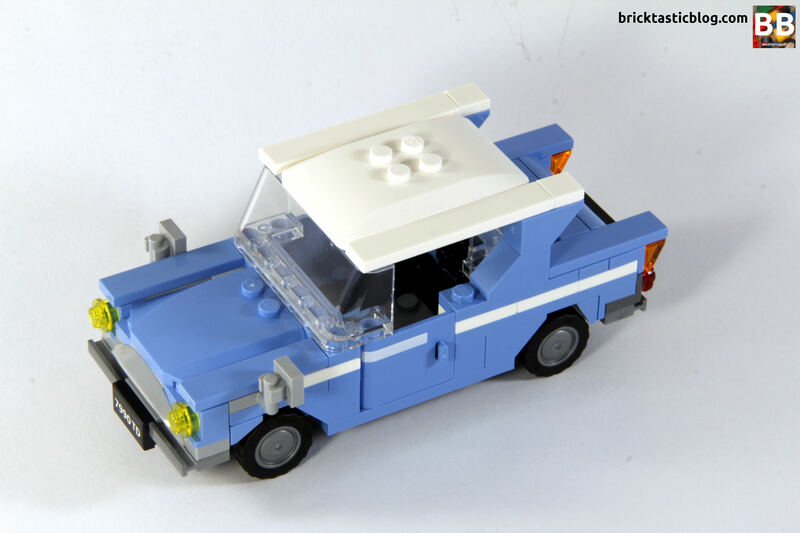 There’s a lot to like in this set when it comes to parts, but let’s take a look at the minifigures first. There’s six in all – four students and two adults. All of the students have the smaller single mould legs, and every minifigure has a double sided head. Each student has a terrified expression on their face, except for Seamus, who’s just sad for some strange reason. Harry is dressed in a red checked jacket and light blue tee, with light grey pants. I love the torso print – it’s simple, yet detailed. Harry’s hair is great, and you can see his scar between the part in his fringe, unlike the CMF versions of Harry, where it’s completely hidden. Ron is wearing a knitted stripey jumper over a red top, with dark brown pants. Both Harry and Ron are unique to this set in these clothing combinations. I love this top on Ron – it’s great to add to the collection. 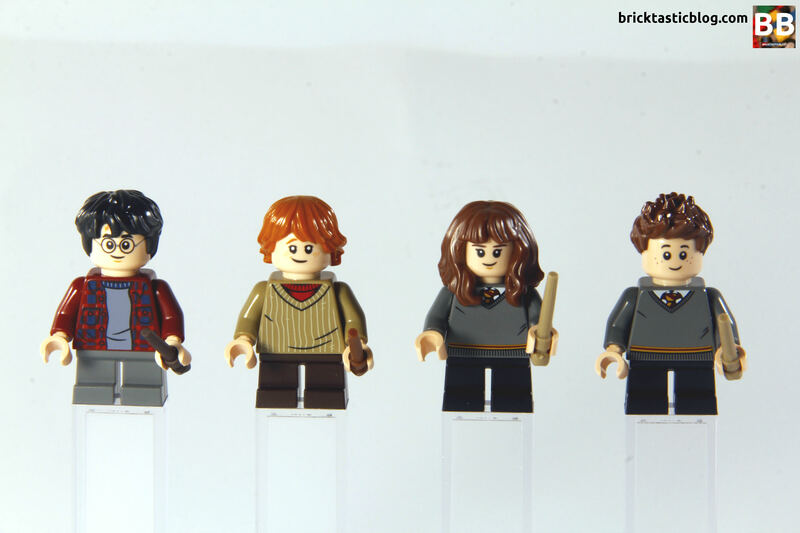 Hermione is in her Gryffindor uniform, so she has been seen in this combination in other sets before. I’m thrilled that we get another excellent hairpiece, though. It’s one of my favourite styles, so having more than one in the collection is great. 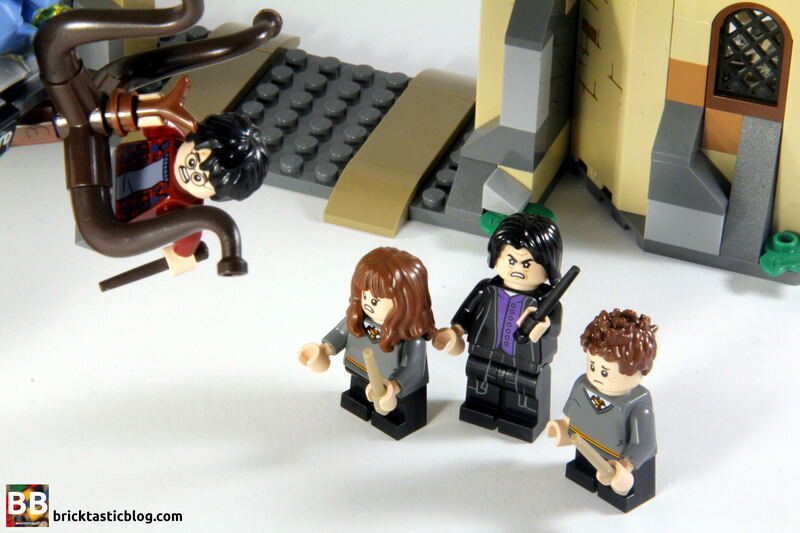 The last student is a new one to LEGO Harry Potter – Seamus Finnigan. The student with a penchant for explosions is a great addition to the lineup, and although he’s in a standard Gryffindor uniform, he still looks good. I’ve heard people say that it would have been nice to have some soot on his alternate face like after an explosion, but it also wouldn’t have fit this part of the storyline, so it’s a forgivable omission. The adults in the set are Severus Snape and Argus Filch. Snape has been seen in this combo before, in 75956 Quidditch Match. He’s wearing a black robe over a purple buttoned shirt. He’s also got his standard grumpy Snape face, as well as a clearly angry one on the other side. I like the printing through the legs to match the torso. 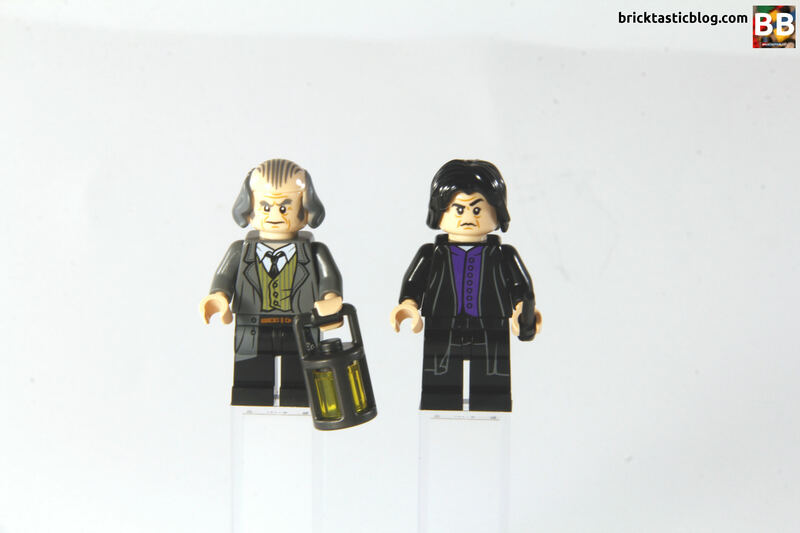 The standout minifigure of the set, though, is Argus Filch. He is unique to this set, and looks superb. He’s got some amazing printing on both his torso and legs, and his wig! It’s excellent, and last seen in The LEGO Movie CMF’s William Shakespeare. I love him, and it’s a great LEGO representation of the actual character. It’s not a 100% perfect inclusion though – Mrs Norris (his cat) is nowhere to be seen. Some of the other standout elements include some new elements in medium blue (seen in the Anglia) including the brick with bow, printed doors and 1×1 plate with vertical stud. This last one is only the second colour variant in a very new element, seen before in medium stone grey in five sets from across a number of themes, so it’s not easy to come by. 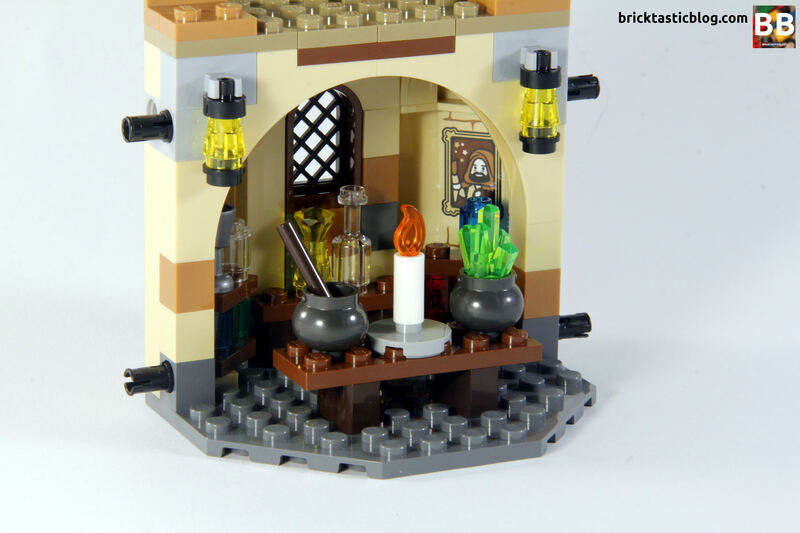 There’s also a new roof element, the new 1×1 plate with leaves, seen in dark green, hinges, curved wall elements, some nice inside corner 2×2 bricks and 2×2 bowed tiles in olive green, and of course, the stand out elements new with the Harry Potter sets, the new minifigure lanterns, candles and candle flames. For a set that’s got a key element of play, it’s a bit sketchy. 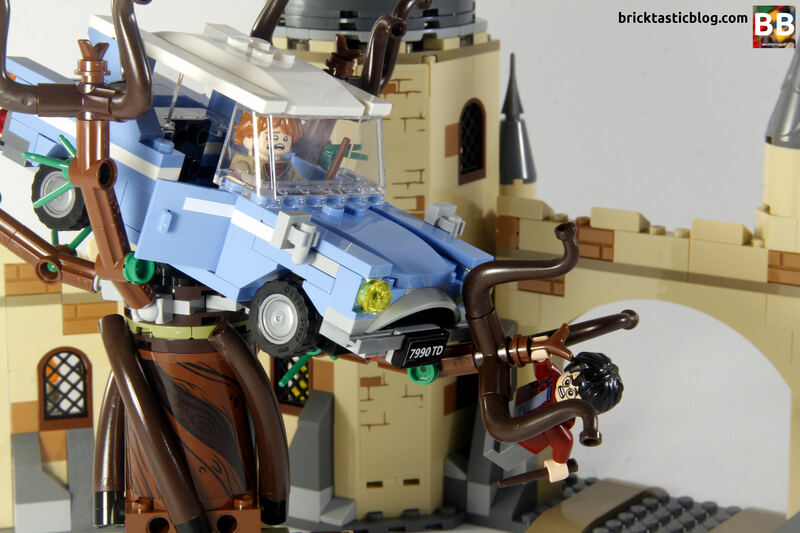 I’ll get into this more later on, but the Whomping Willow doesn’t seem to hold in the Anglia very well, so spinning it with even a little bit of gusto will not only send parts flying, but the car will immediately fall out. Just getting the photo below meant I had to time it perfectly so it didn’t all fall apart! The interior of the castle section is full of goodies, including a Gryffindor dorm room, potions room and Snape’s office, an owlery, and of course the Ford Anglia, so there’s some play options in there, but when the set is called Whomping Willow, you expect that most of the play will be with the actual subject matter. To be honest, I’m a little disappointed. 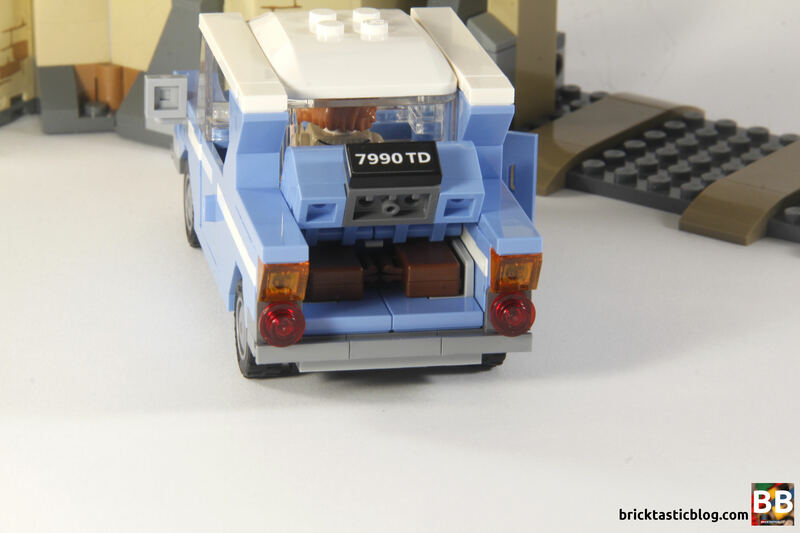 The build process begins with the Ford Anglia. It’s a fun little build with some clever techniques including an upside down section that slots in, forming the front section of the front wheel arch. The use of a wheel arch element for the grille is also fantastic. Add in the printed doors to match the pinstriping and this equates to a superb little model. There’s even a little boot for the suitcases, which is well done. The build continues with the namesake of the set, the Whomping Willow. It’s very well built, using a simple design of a central stickered column with brown tail elements wrapped around it. The branches are also quite good, but the green plant stalk elements which are meant to stick to the sides of the brown Technic elements do not stay in. This has been seen by a number of builders of the set – it’s amazing it got to production in this state. That might seem like a bit of an over-reaction, but with the stringent quality controls that LEGO has, I’m surprised it got through. There’s a passageway underneath the Whomping Willow that leads to the Shrieking Shack, and while it’s a fun addition, it’s not all that exciting. Adding a rotating knob to the side gives the tree some life, causing it to twirl around. Unfortunately the branches don’t move independently, but they can be positioned as they’re on ball joints. 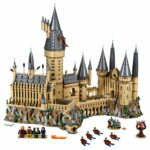 The castle section is actually pretty massive – again, it’s odd from a set that should be all about the Whomping Willow. As you work your way along the building, it’s a simple build – there’s no real fancy techniques, and there are a number of larger wall elements that are incorporated into the build, so it comes together quickly. The interiors are a little more interesting, but aren’t difficult. 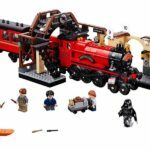 While the set looks good as a whole, and is fun to play with, there is a design flaw that I think need to be addressed. 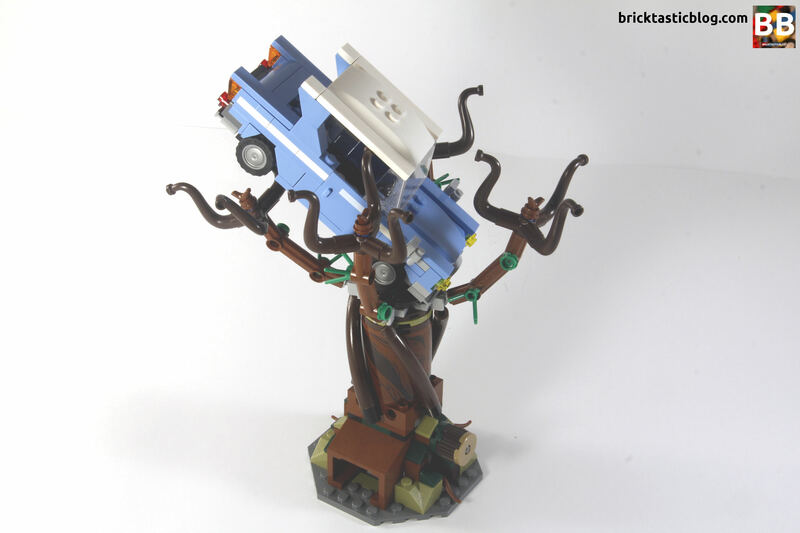 In my set at least, the Whomping Willow doesn’t really support the weight of the car. The Mixel ball joints are just too weak for those arms. It can support the vehicle if it’s not moved at all, but as soon as it’s spun, it falls out. As a play set, it’s a little disappointing to have this design. At face value though, it’s great. 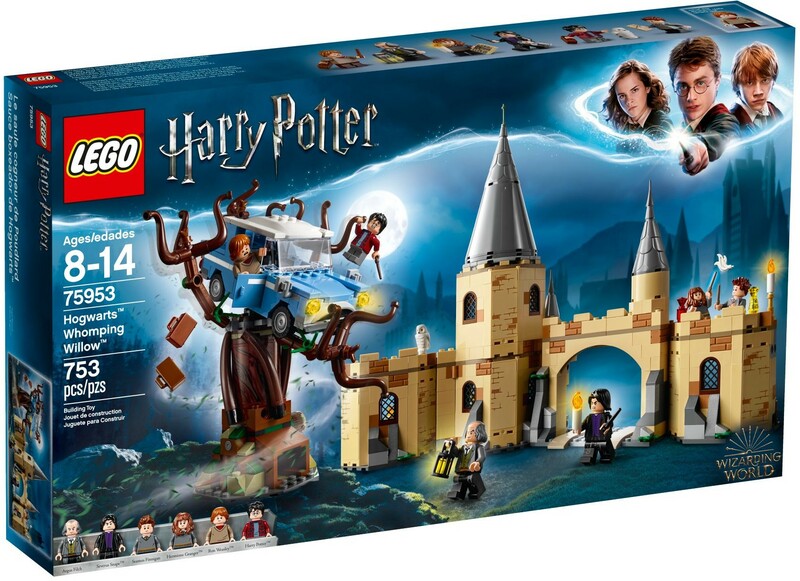 I still believe that it would have been better served putting more focus into the tree, rather than the castle, to make it just a bit more impressive, but it’s a good way to get more of a Hogwarts Castle if you’re willing to shell out some cash for the other sets. The castle is big, and the tree is recognisable and will be easily spotted in a display. It’s not going to be possible to get the right scale of the tree to match the car, but it was a good attempt. The interiors look great – there’s enough detail in the small sections to really make an impression. I really like them. There’s not much space in any of them, but they do okay. The owlery bed and potions room are in the tower and adjoining room, with Snape’s office on the other side of the castle section. It’s enough to at least get the imagination going. For AU $100, this set is quite well priced. 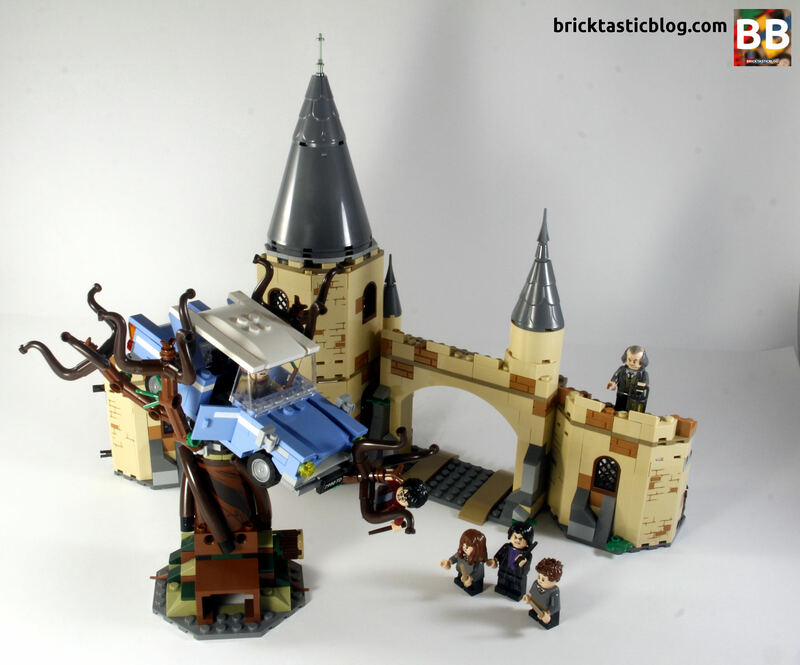 There are some unique minifigures, a fantastic car, more Hogwarts Castle and of course, the tree. 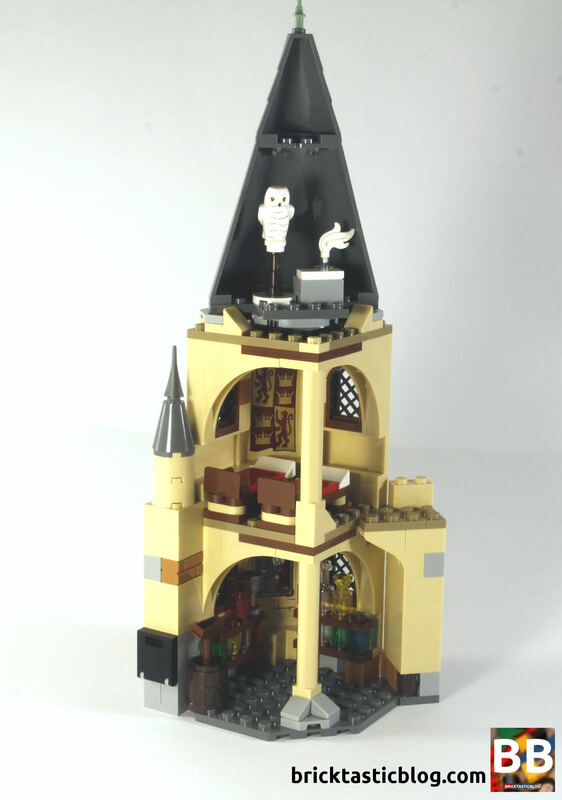 Yes, the design is a little lacking, and the play features are not the best, but you get some good parts, great minifigures, and a bonus bit of extra Castle, so I think there’s decent value for money in this set. Obviously there’s the uniqueness of the Whomping Willow. It’s the first time it’s been portrayed in LEGO form, so it’s highly collectible. It also carries the Harry Potter theme branding. 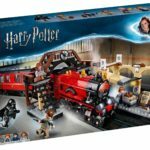 Given the popularity of the previous waves of Harry Potter sets, this is sure to be popular. There are unique minifigures as well, and it’s quite affordable, so it’s well worth picking up.